I’ve always admire women pro footballers. They’re intense and have that unique footballer persona that I know many of us would want to imbibe. But before I can even start dreaming of getting a shot to be included in the team for future AFC Women’s Asian Cup tournaments or even the FA Women’s World Cup, I have to start with the basics. That’s when I got introduced to the game of indoor soccer or futsal. Professional footballers shared with me their secret; whenever it’s the off-season, they always play indoor futsal. Here’s how playing indoor soccer can prepare you for the big league. One of the least-obvious yet most important benefits of playing futsal is its ability to improve one’s decision-making skills. Every team sport relies on the ability of players to make sharp and lightning-quick decisions that can spell success for the team or contribute to its failure. 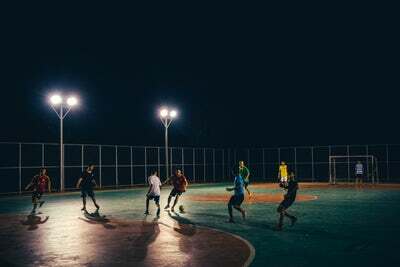 Since indoor soccer only involves 10 players, 5 from each side with 4 on the ‘field’ and a goalie, you’ll get to practice making really quick decisions. Opponents can easily swarm you so you’ve got to decide whether to pass the ball or to keep on dribbling and defending it with all you can. The ability to make decisions is crucial to the game of association football. Harnessing it while in a smaller playing field should help you better prepare for the national stage. It strengthens the leg for kicking. The ball used in indoor futsal is generally heavier than the ball used in association football. This is because the bladder of the ball is usually filled with foam, making it denser and heavier. It also has less bounce so that it will not be flying through the roof of a covered futsal court when it hits the floor. Because of this heft in the indoor futsal ball, the muscles of the legs will have to work harder to dribble and kick the ball towards the net. You can almost see the implications of strengthening the legs when you’re already outdoors. I have always been fascinated by pro footballers fully capable of kicking the football just beyond the penalty arc and watch it fly in an elegant parabola across the halfway line before landing in the penalty area at the other end of the field. Now I know how they prepared for such a feat. Association football is a team sport. However, we really cannot deny that individual skills also matter. That’s where your strikers and defenders come from. Now you can be both, of course. But wouldn’t it be a lot better if you exceled in one first before you move on to the next? This is one of the most amazing things about playing futsal. Since you’re essentially playing with 3 other members of your team (with the 4th guarding the goal), you’ll have to push yourself to become more creative because it will be quite impossible to rely on your teammates (they’re being heavily guarded, too, you know?). It builds confidence in going one-on-one. Most of the time, you’ll be playing one-on-one. Playing futsal is the best time to hone your skills in getting away from your defender. And if you happen to be the defender, it’s the perfect opportunity to sharpen your competence at ball tackling without incurring penalties. Over time, you’ll build greater self-confidence, helping you prepare for the big league. Trust me, I know. Playing futsal may seem like child’s play for some. But ask any pro footballer and they can tell you straight in the eye that a game of futsal is an excellent prep work for the big league. Posted in Sports | Tagged No Comments.